The BAFS are also involved in another excavation at the site of Dún Ailline in County Kildare, an early medieval royal site, directed by Dr Susan Johnston of George Washington University. Season 1 excavations took place in 2016 and we hope to facilitate another season in the coming year, 2018. Excavations in the summer of 2018 are going to focus on the entrance to the first large-scale Iron Age structure at Dún Ailinne. This is known as the Rose phase, and earlier excavations showed that it was a large figure-of-eight shaped timber structure approached by a funnel entrance. Remote sensing between 2006-2008 added to this—surrounding the timber circles there was a larger enclosure which appeared to have an entrance giving access to the figure-of-eight circles along the funnel-shaped approach. In the summer of 2016, we did some testing in this area and were able to locate the enclosure on this part of the hill. It is a ditch about 1m deep with fragments of burned post and lots of animal bone, some burned, probably the remains of feasting. In 2018, we are planning to locate the actual entrance and see what its characteristics are—was it elaborated with posts or other features? Was there a prepared roadway leading into it? Are there deposits of artifacts or other materials to mark the entrance? All of these questions will be addressed through our research in the summer of 2018. 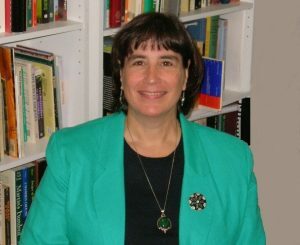 Susan Johnston is a part-time faculty member in Anthropology at the George Washington University in Washington, D.C. She teaches a variety of courses in anthropology and archaeology, including the archaeology of the Celtic peoples, archaeological myths and mysteries, and the anthropology of religion. Professor Johnston has carried out archaeological research in Ireland since the 1980s, when she did her PhD dissertation on Irish rock art of the Neolithic and Bronze Age. She has also done archaeological work in such varied places as India, England, and Rhode Island. She is particularly interested in the analysis of religion and ritual in the past, and her research has focused on the analysis of ritual sites. She is currently conducting research at the site of Dún Ailinne, Co. Kildare, Ireland. This site saw a variety of ritual uses between 3500 BCE and 400 CE, being used as a place for burial in the Neolithic and Bronze Age and as the ceremonial center of the rulers of the ancient kingdom of Leinster in the Iron Age. She has published a number of articles and research reports, including the book Dún Ailinne: Excavations at an Irish Royal Site, 1968-1975, with Dr. Bernard Wailes, describing excavations carried out there. Between 2006-2008 she directed a remote sensing survey at Dún Ailinne in collaboration with Dr. Pam Crabtree of New York University and Dr. Doug Campana of the National Park Service, which revealed a number of new features at the site. Her most recent work has been following up on the remote sensing survey through excavation, carried out through an archaeological field school with the IAFS. This work has explored the first monumental timber structure of the Iron Age at Dún Ailinne. Pam Crabtree is an Associate Professor of Archaeology at New York University where she has worked since 1990. She is a zooarchaeologist, and her primary area of interest is the study of the archaeology of later prehistoric and early medieval Europe. She also has a strong secondary interest in the archaeology of the Ancient Near East from the late Pleistocene through the medieval period. Crabtree teaches a variety of courses at NYU including zooarchaeology, later European and Near Eastern prehistory, medieval archaeology, archaeological theory, and NYU’s introductory archaeology course—Archaeology: Early Societies and Culture. Crabtree has been active in field archaeological research since 1971 when she worked in the Winchester Excavations in England. She first worked at Dún Ailinne with Bernard Wailes in 1972 when she was a beginning graduate student. 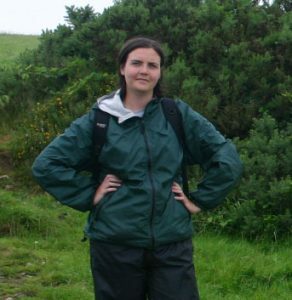 She was the zooarchaeologist for the original Dún Ailinne excavations, and she was a member of the 2006-08 magnetometry and topographic survey at Dún Ailinne. Crabtree is also the zooarchaeologist for several projects in the Near East including the Amheida project in Egypt, the Kinik Höyük and Tepecik projects in central Turkey, the Shengavit project in Yerevan, Armenia, and the Kyzyltepa project in Uzbekistan. Zenobie S. Garrett received her Ph.D. from New York University in 2016 and is currently a Visiting Scholar in NYU’s Department of Anthropology. Her research focuses on the interaction of communities, globalization, and landscape in late antiquity and the early medieval period. She has taught a range of courses, including anthropological methods and theory, spatial analysis, and European prehistory, in a variety of academic settings. Outside of the classroom she has worked on archaeological broadcasts, blogs, and websites to promote public engagement and education. As a landscape archaeologist, Dr. Garrett is interested in understanding why people chose to live where they did despite the challenges they may have faced. She has worked in Peru, Ireland, France, Oman, and the U.S. to explore the wide variety of living options available to humans and the unique social and environmental challenges involved in the maintenance of wherever people call home, both in the past and today. To answer these questions, she uses archaeological survey and spatial analysis to understand how past groups organized themselves and thought about the landscape around them. 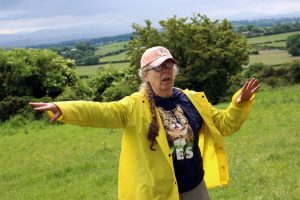 Dr. Garrett has worked in Ireland since 2007 when she took part in the reexamination of the Irish National Monument of Dún Ailinne through remote sensing techniques. She currently serves as the geospatial director of the field school excavations.